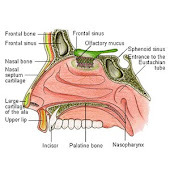 The cartilage of the septum (or septal cartilage, or quadrangular cartilage) is somewhat quadrilateral in form, thicker at its margins than at its center, and completes the separation between the nasal cavities in front. Its anterior margin, thickest above, is connected with the nasal bones, and is continuous with the anterior margins of the lateral cartilages; below, it is connected to the medial crura of the greater alar cartilages by fibrous tissue. Its posterior margin is connected with the perpendicular plate of the ethmoid; its inferior margin with the vomer and the palatine processes of the maxillae. The term L strut can refer to the specific area in the quadrangular cartilage region that remains after septal cartilage is removed from the area normally for grafting purposes. It can also refer to a synthetic L shaped implant. Sometimes if too much cartilage is removed from the septal quadrangular region then reconstruction is needed to maintain the sacrosanct L strut for fundamental support of the nose. Dr. Naderi mentions in his blog: Septal cartilage: A large portion of the Septal Quadrangular Cartilage can be harvested and used during Rhinoplasty. “An L-strut” must be left to support the nose. This L-strut must be at least 1.5cm in width to support the bridge and tip. ( Note: That is general standard accepted in the practice )The remainder of the cartilage can be removed and used for Rhinoplasty. In Revision Rhinoplasty, this cartilage is often missing and unavailable, as it may have been used during the previous Rhinoplasty surgeries. Septal perforation (hole) is a risk of septal cartilage harvest or septoplasty. This cartilage is often missing and destroyed in patients who have been struck to the nose very hard (boxers) as well as patients with history of Cocaine abuse or autoimmune diseases. The combination of the cantilevering dorsal element and the buttressing caudal element forms the basis of the L-shaped strut- the most structurally important aspect of the quadrangular cartilage. Compromise to the dorsal component leads to a saddle nose deformity with ventral collapse of the upper cartilaginous vault. The classic example of this is quadrangular cartilage resorption after an untreated septal hematoma. Compromise to the caudal component may lead to nasal tip ptosis, particularly in the presence of weak medial crura. Tramatic or iatrogenic injury is most often the cause. For these reasons, it is critical to maintain structural integrity of the L-strut during surgery. Although conventional teaching emphasizes the need to maintain an uninterrupted 1.5 cm wide dorsal-caudal strut, malposition or deformity of the strut itself may be the cause of external deformities, particularly in the crooked nose. Correction of these problems may mandate the use of techniques that modify the septum and may require repositioning, camouflaging, or reconstruction of the L-struct itself. Now, here's information on Synthetic L implant. An L-strut lays over the entire bridge and extends down under the tip to the base of the columella. It gives the tip definition by placing a fair bit of pressure over a small area of skin to tent the skin out. It cannot reproduce or retain the natural shape of your tip. As a result, it can look a little too pointy and unnatural.Sometimes, this pressure on the skin can become too much for the skin to bear. Our preference for ethnic augmentation rhinoplasty is to use your own cartilage for augmentation.